And there was so much to do there! I mean, you could ride on a boat shaped like a swan with your sweetheart. THAT IS LIKE SOMETHING STRAIGHT OUT OF A MOVIE, Y’ALL! 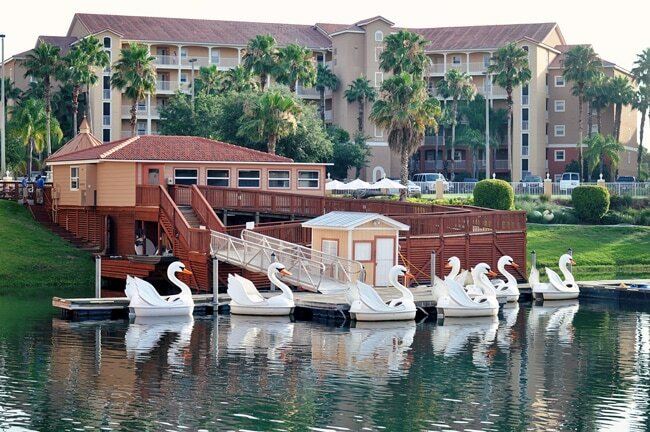 Or, if you are like me you can just ride on one all by yourself because who doesn’t want to ride on a swan shaped boat? I don’t even like boats and I thought it sounded like a great idea. If you are vacationing with children then the Westgate Vacation Villas are ideal because they are so kid-friendly. There is a blow up waterslide. And playgrounds. And a mini-golf course. I know! You don’t even have to fight traffic to go play putt-putt, you can just walk across the lawn. At first I was a bit put off by what I thought were random dinosaur structures strategically placed on one side of the resort because I was like “Why all the random dinosaurs, Westgate?” And that’s when my friend Missy was all “Um, that’s the mini-golf course.” Then the dinosaurs made a little more sense. Seriously, coolest thing ever. They even have a train that goes around the resort for the kids to ride. My two year old would have loved that! They also have a trolley. I loved that. I was a kid who grew up on Mister Roger’s Neighborhood so I have a fondness for trolleys. There is a great store and some little shops on site where you can pick up essentials (they even gave me coupons for freebies when I checked in!) and there is also a restaurant called Drafts where we had cocktails and dinner one night, as well as the buffet breakfast in the mornings. As far as the food goes I thought it was standard hotel fare: it tasted decent but was a bit pricey for what was offered. Since there is a full kitchenette in the rooms, you’d be better off bringing your own meals to prepare. If you want to eat a meal or two out I would recommend visiting some of the other attractions like Charley’s Steakhouse (which was delicious and I’ll talk more about soon) to get the best meal for your money. Speaking of the room, it was fantastic. It included a full kitchenette and a washer/dryer. Do you know what I love about having access to a washer/dryer when I travel? Less packing. And less packing means less luggage. And less luggage means no paying extra bag fees! The kitchenette was fully stocked too, with all of the cooking utensils and dishes and cleaning supplies that you might need. It also had a great bathroom with a huge waterfall shower. I have a two year old. Do you know how often I get to shower alone? Basically never. I spent a LOT of time in that shower. It was so comfortable! It had a ton of pillows! That’s an awkward picture of me standing on the bed trying to get a picture of the room. But see how I’m sinking down into the mattress? Because it was so cozy! Also, it was huge. The den housed a pull-out sofabed so the one bedroom villa could have easily slept four people. That’s an amazing deal. I was pretty stoked about the wifi and also about the television although to be honest, I didn’t watch it at all because I was so busy visiting all of the attractions around Kissimmee! I did watch the Westgate channel for a little bit, which is where I learned pertinent information such as where the blowup waterslide was located. It was definitely one of the nicest places that I have ever stayed on a vacation and I really enjoyed it. They have a shuttle that runs to the big parks (aka DisneyWorld) since they are so close by and their rates are surprisingly affordable. I thought they would be one of the pricier resorts given how nice the accommodations were but they start at $99 a night! 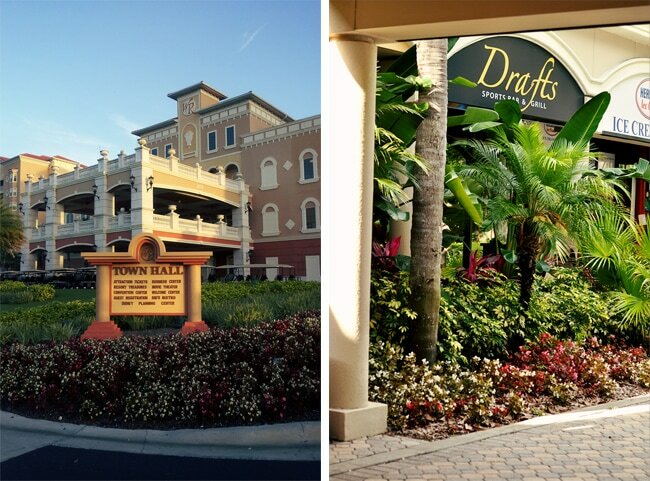 It’s definitely worth checking out if you’re planning a Florida vacation. We’ve stayed here before and it is a really nice resort. Wow. The price is right too! What a fun time, it looks like a great place! 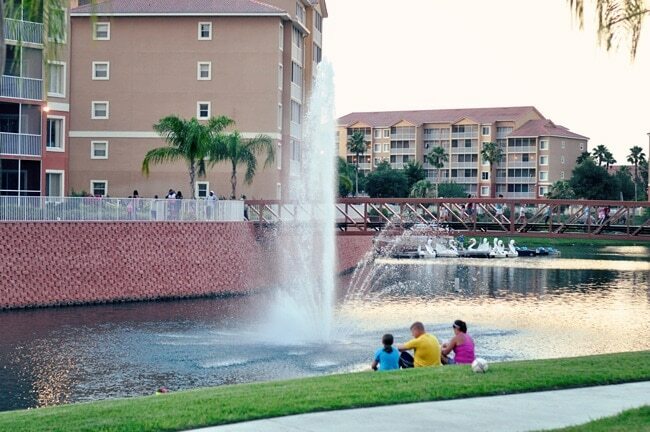 It looks like such a nice place to stay when visiting Kissimmee. 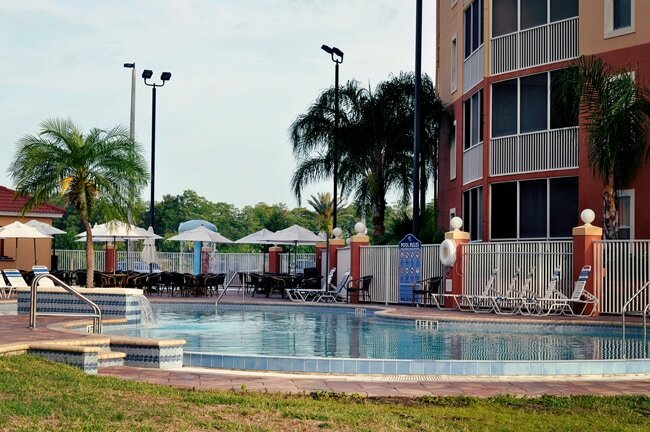 This looks like a great place to stay in Kissimmee! It’s heck of a lot more affordable than getting a hotel room at the resort. What a great place to stay! I love the swan boats! What a gorgeous resort! It looks so inviting and I love the price! This is the place to stay if you have kids; the kitchenette and a washer/dryer really clinch it for saving on expenses. I was just down that way last week. It looks beautiful. i would love to stay there. I wanna go there! I’ve only been to Florida once, and I was stuck in Altamont Springs in a hotel room while my husband attended training. 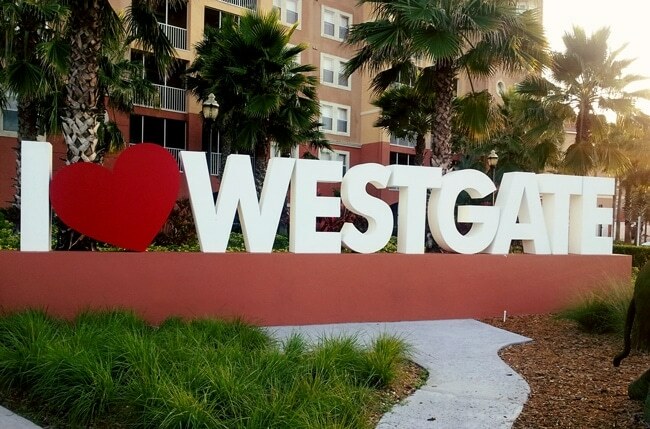 We stayed with Westgate when we went in March and LOVED it there. It really is a great resort, lots to do and so centrally located. Thanks I’m always looking for good places to stay in that area. 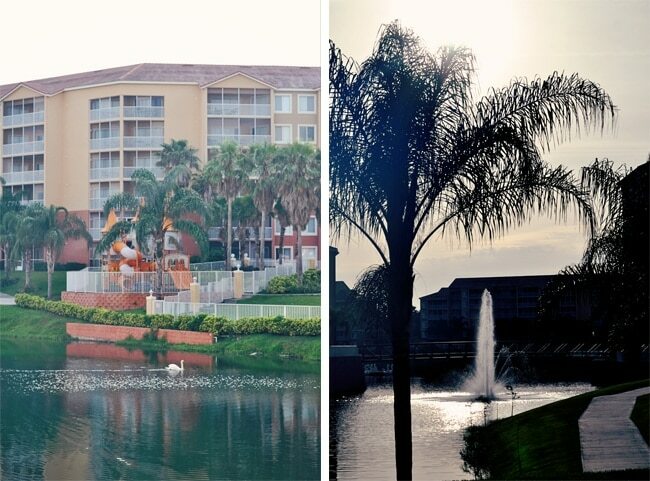 My family visits Florida often, so I am always looking for a place to stay there. Thanks for the recommendation! Can I live there?! Wow it’s incredible! Excellent pictures too! You get so much bang for your buck at Westgate. I’ve stayed there and it’s such a lovely property. 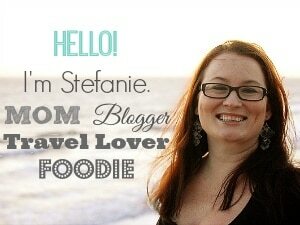 As self proclaimed foodies, my husband would be thrilled to pick up some fresh local ingredients and cook a meal or two in the kitchenette. I really appreciate that this resort seems to offer so much more than just a standard room! Certainly a beautiful place to stay. Oh, my goodness — I WANT THAT BED! I want to ride inn one of those swan shaped boats! Gorgeous resort! And I would love to ride a swan shaped boat. $99 a night in Kississimme – incredible! It looks like a really nice place for that price. Hi there my family representative! I must express that this text rocks !, terrific composed and are avalable together with around all substantial infos. I want to observe much more discussions in this way . They specialize in supplying drivers with Liber-t tags that enable convenient passage through the auto-routes of France. High resolution photography available upon request. leave him home alone as opposed to television or the radio.